Derrick Rose Returns as Brazil Routed by U.S.
Derrick Rose the All-Star guard for the Chicago Bulls made a triumphant return to the basketball court for Team USA. He played in his first game in more than 9 months. 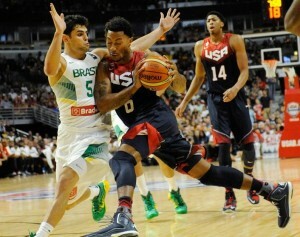 Rose was rusty, which is understandable but he helped the Americans to rout Brazil 95-78 on Saturday evening. He did show some flashes of brilliance that won him the MVP award in 2011 and made him one of the most exciting players in the NBA. Tom Thibodeau his coach with Chicago and an assistant with Team USA called Rose’s return to competitive basketball a process that is step-by-step. He told reporters he loved the way Rose was playing and although he showed some rust, he had explosiveness and played well on both offense and defense. Thibodeau is not one to give praise lightly, which would indicate it was great news for both Team USA and the Bulls. The Americans are trying to recover from the surprise announcement made by Kevin Durant that he would not play for the club due to being mentally and physically exhausted. The offense for the U.S. was by no surprise, to be focused around Durant the current MVP of the NBA, but now head coach Mike Krzyzewski and his assistants must find options with just two weeks to go before the FIBA World Cup in Spain. Anthony Davis scored 20 for the U.S. and looks like he could be a go to guy for the team. He added 8 rebounds and 5 blocked shots. James Harden scored 18 and Klay Thompson added 10. For Brazil, San Antonio center Tiago Splitter scored 16 points, while Rafael Hettscheimeir added 13. Coach K said he was pleased with the results and how the team was playing, as it has been difficult to get continuity with all the interruptions that have taken place. The biggest story however on the night was the return of Rose. Over the past two seasons in the NBA, Rose has played just 10 games due to two knee injuries. His coach at Chicago said it was unfortunate Rose was hurt but the adversity he has gone through has made him stronger.